SMASH 2 Is "One to Note" for Spring 2018! The media coverage of SMASH 2 begins with 100 Scope Notes including our book on its list of “10 to Note” for Spring 2018. Smash is featured among some truly awe-inspiring company, too! Preorder Book 2 Right Now! Have you heard? 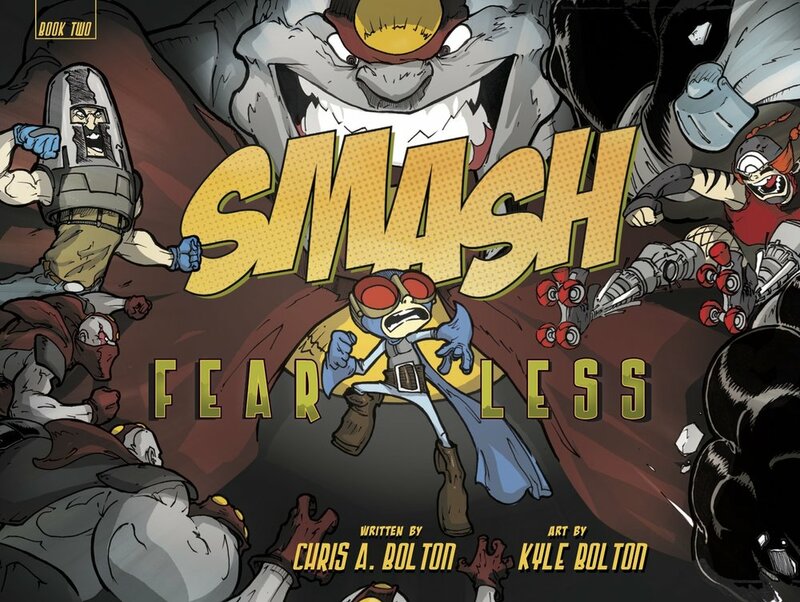 SMASH BOOK 2: FEARLESS is coming out in trade paperback and hardcover editions on May 9, 2018! The long-awaited trade paperback edition of SMASH BOOK 1: TRIAL BY FIRE will go on sale then, too! To make sure you get your copy in time, preorder it right now! They'll be happy to make sure your copy is waiting for you the day it comes out! Welcome to 2018—The Year of Being Fearless! We're so excited that SMASH BOOK 2: FEARLESS is dropping May 8, 2018! As we approach the publication date, we'll have lots of previews, behind-the-scenes peeks, giveaways, and other goodies to whet your appetite. Check back often and let us know what you think! Presenting... SMASH Book 2: FEARLESS! We're thrilled to announce that SMASH Book 2: FEARLESS will be published on May 8, 2018! Superhero. Super young. Super freaked out! In his second adventure, Smash has his hands full with old enemies and a few new ones — not to mention homework. 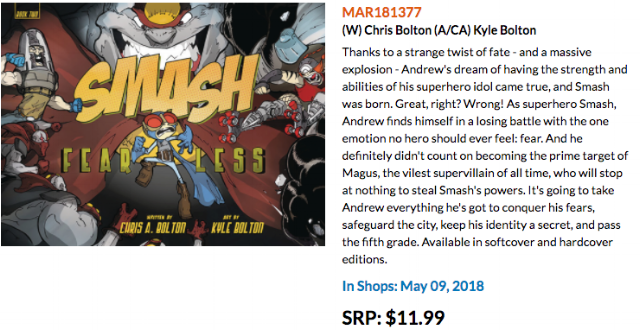 Thanks to a strange twist of fate — and a massive explosion — Andrew’s dream of having the strength and abilities of his superhero idol came true, and Smash was born. Great, right? Wrong! As superhero Smash, Andrew finds himself in a losing battle with the one emotion no hero should ever feel: fear. And he definitely didn’t count on becoming the prime target of Magus, the vilest supervillain of all time, who will stop at nothing to steal Smash’s powers. It’s going to take Andrew everything he’s got to conquer his fears, safeguard the city, keep his identity a secret . . . and pass the fifth grade. There Will Be a SMASH Book 2! We are thrilled to announce that we've just finalized a contract with Candlewick Press to publish SMASH BOOK TWO! And, as you can see, we're flying in circles over it. For now, the title and plot of the book are sealed inside an underground vault in the Magus's secret lair and guarded round-the-clock by his Minions. While we don't have a publication date yet, rest assured we're working as fast as we can to bring new adventures of SMASH to all our fans. Candlewick Press also published SMASH: TRIAL BY FIRE, our first all-ages graphic novel featuring 10-year-old superhero Smash, and we couldn't be more excited to work with them again. In addition to creating a gorgeous book that's a pleasure to read, Candlewick has worked tirelessly to promote SMASH, leading to glowing reviews, literary prizes like the Oregon Spirit Book Award and Children's Choice Book Award, and a legion of young readers who have let us know they can't wait for more SMASH. We're especially excited to collaborate again with our fearless editor, Mary Lee Donovan, whose guidance and enthusiasm helped us develop our webcomic into a finished book we can be proud of. And we want to thank our agent, Bernadette Baker-Baughman at the Victoria Sanders Agency, for her patience, support, and all-around awesomeness. We'll keep you updated as Book Two progresses. For more information, sign up for the mailing list in the margin at the right to get all the latest news while it's hot! You can also follow SMASH on Twitter and Facebook. You may have heard that SMASH: TRIAL BY FIRE won the 2013 Oregon Spirit Book Award for Graphic Novel. On Saturday, October 4, SMASH writer Chris A. Bolton attended the awards ceremony at Wilsonville High School. Sponsored by the Oregon Council of Teachers of English, it was a wonderful day that kicked off with a rousing keynote speech by author Brian Doyle. Then the winners were each presented a beautiful plaque onstage and given a few minutes to speak. Afterward, they had a chance to sign books and mingle with teachers and other nominees. Chris heard from several teachers who were phenomenally excited to introduce SMASH to their classroom. From the bottom of our hearts, we want to thank the OCTE for this honor. Their award highlights a variety of children's books from Oregon writers and helps introduce the value of stories to young minds that crave them. We are deeply grateful for this award and a wonderful ceremony! Our graphic novel has had a remarkable first year, earning rave reviews and prizes like the 2013 Oregon Spirit Book Award and a Children's Choice Book Award. 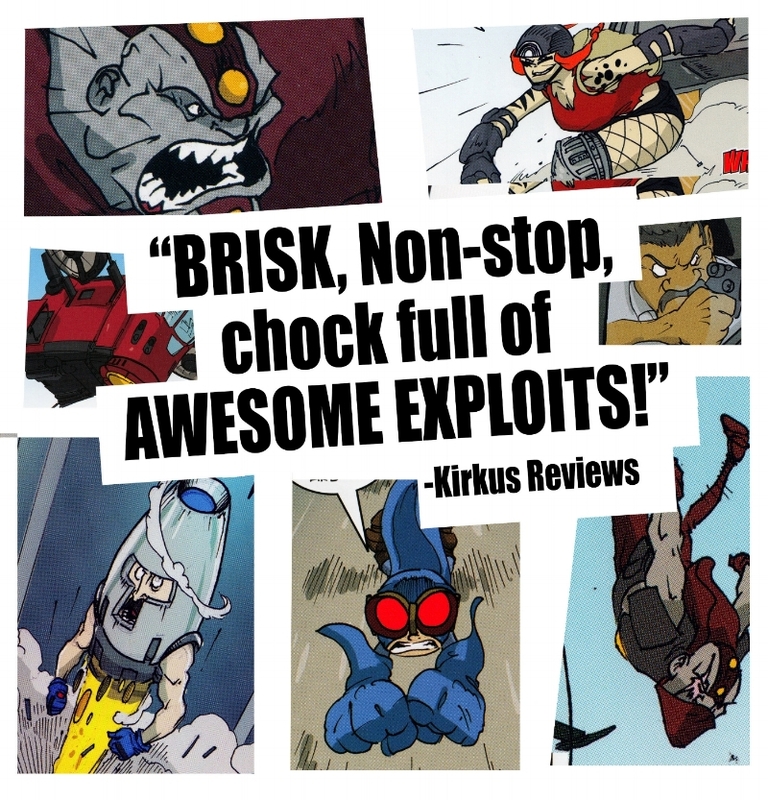 Kyle and I have made appearances at classrooms, bookstores, and comic conventions, where we've gotten to meet enthusiastic Smash fans and introduce our 10-year-old superhero to some eager new readers, as well. From the bottoms of our hearts, we want to thank all of our readers and fans for making this first year so fantastic. Thanks for reading! And huge thanks to everyone who's helped us get the word out about Smash — we couldn't have done it without your support. We're excited to see what the future brings! Random Chalk Talk — Guest Post on the evolution of SMASH from webcomic to book. Powells.com Book Blog — Guest Post on the birth of Smash, featuring the scandalous true story how we designed and created the character. Who R U Blog — Q&A with Kyle and me talking about what it's like to work together as brothers and other titillating tales. Cynsations — Guest Post, "Graphic Novel 101" — how we make the comic. Green Bean Teen Queen — Guest Post about the magic of libraries and how they helped create a certain pint-sized superhero. Charlotte's Library — Guest Post featuring a comic titled "The True Origin of the Brothers Bolton." Yes, it's all true! Hooked On Books — Guest Post featuring the SMASH playlist, for the perfect soundtrack to accompany the book! Bildungsroman — Q&A with Kyle and me.